Do you do a word for each year? I usually do and enjoy focusing on that particular word for the year. I find it helpful to pick a word that will grow me closer to God and make my attitude more in line with being a Christian. 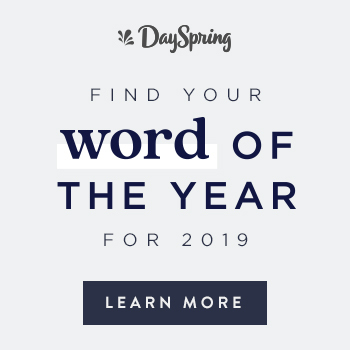 There are a lot of different places that you can learn more about this but DaySpring is making it super easy for us by providing a place where we can find our word for the year. Here's the link to that website if you'd like to check it out. I think it's so important to pray about your word. God knows what we need to focus on in the coming year and what we will need as we traverse through each day. Of course, don't feel compelled to do the word for the year. This is only if you feel it's something that will work for you or that God is calling you to it. My word for 2019 is RENEW. This word means a lot to me for so many different reasons but mainly because I feel like so many things need to be renewed in my life. For the past almost five years, a lot of my life has been on hold for one reason or another but mainly from health issues. Since my surgery in March, I have been slowly but surely getting healthier and feeling better. For the first time in many years, I am excited about the new year and what my part in it will be. Renew to me also means restore. In fact, I almost chose restore, but I don't want to just restore things, I want them to be better and do things that I know the Lord has gifted me to do. I want to do things I love but in a new way. To renew my life in all the areas that have been neglected or damaged over the past few years. Remembering my word keeps me focused and excited about doing the things that mean so much to me. God has given us each special gifts and He truly wants us to use these things for His glory and our happiness. After all, if we are doing what we are called to do, it's going to bless that inner part of us that needs to feel we are vital. My goals for this year are to grow closer to God through my Bible study and prayer. To design artwork again and other artistic endeavors. To do things that I haven't been able to do for so long and to make my family my priority. All for the glory of God. Yes, we do a word for the year, as a family. We have been discussing it and think we have come up with the right one, but we are still seeking the Lord about it. I love your word, "Renew." It is just a beautiful thought, and I trust Jesus to bless you abundantly in this new year. I will answer your precious email as soon as I can. It meant the world to me. Sending much love and many hugs your way today!